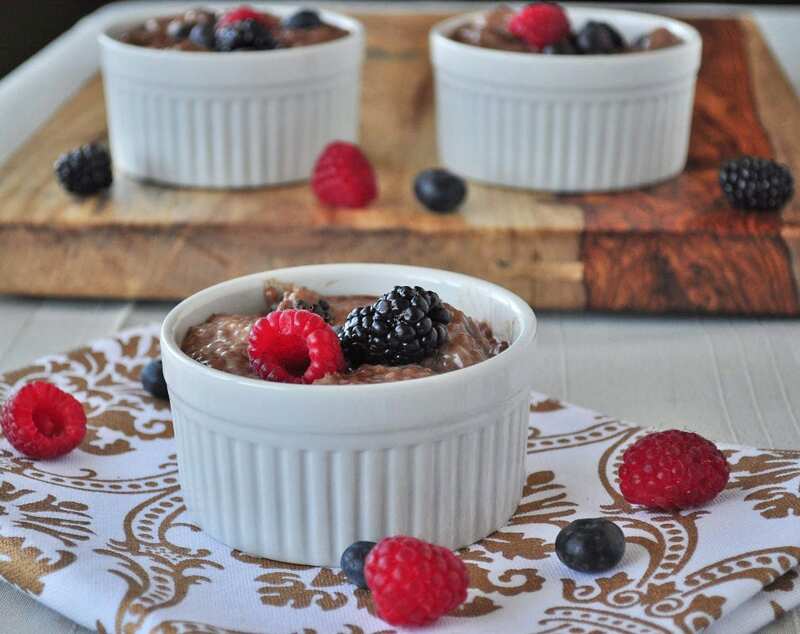 I highly recommend this Chocolate Chia Seed Pudding. I have been really into chia seeds lately. They are so good for you and the high fiber content keeps you full for a long time. So when Pacific Foods sent me a few samples of their unsweetened non dairy milk, I knew I had to make a chocolate chia seed pudding. I already have a Chia Seed Pudding on the blog, but this time I decided to switch it up and do a chocolate version. I used Pacific’s new unsweetened hemp milk for this recipe. I love the unsweetened milk because I like to control the sugar in my recipes. This tastes decadent enough to have for dessert, but it’s also healthy enough to have for breakfast! I have been pretty stoked lately to see the organic berries coming back to the supermarket. I have been waiting for them all winter. They taste so good. Both my kids loved it. 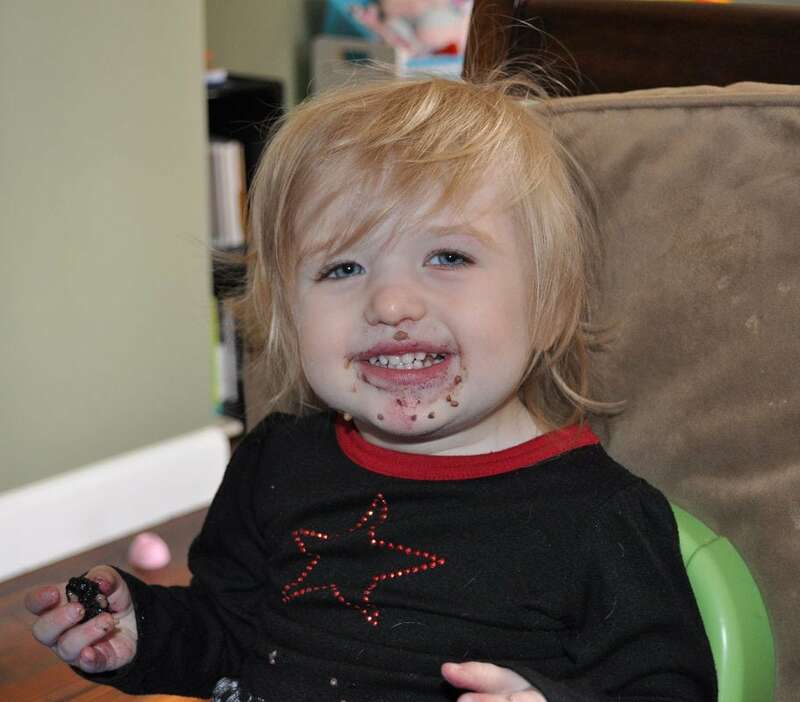 Even my daughter Olive, who is tube fed, ate this up as you can see from the messy face in the next picture. Who can say no to anything chocolate? Another great thing about this healthy chia seed pudding is that you can easily take it to work with you. Just put it in a small mason jar and you are on your way to work! It’s a healthy breakfast recipe that should keep you fueled all the way until lunchtime. So you can see they are very versatile. Healthy enough for breakfast, but can be dessert too! Mix everything up in one big bowl. Stir well and stick in the fridge to set for at least a few hours. This recipe is super easy and my kind of recipe! If you like a thicker pudding though, you can add a bit less milk. Do you stir by spoon or mix in the food processor? I just stir with a spoon. My almond milk has tricalcium phosphate, gel lab gum, do potassium phosphate, Sunflower Methasone vitamin A, palmitate, vitamin D two, DL alpha tocopherol, acetate vitamin e. Just wondering if anybody knows if this is safe and healthy for consumption. I think those are all just vitamins? I am not 100% though. I just tried it today, it was good, I just made the one serving way you suggested, I added one packet of stevia in the raw, yummy! I blend the whole concoction for my daughter. She doesn't like "chunks" in most of her food. I have used maple syrup, agave and even sugar (in a bind without any "better" sweetener). I'll be trying vanilla soon. I use this as part of my daily dose of Omegas. It makes a great, easy breakfast. What does "tube fed" mean? I made this last night and surprised the boys with breakfast chocolate pudding! They were thrilled and wanted seconds. I put a little whipped cream on top, as part of the treat. I realized as I was already mixing the ingredients that I forgot to get the fruit at the store. I had to leave it out, so I added in 1/2 cup of coconut. I just used regular milk, too. It is awesome! If going to blend for smoother consistency, should I blend before refrigeration or after? Thanks! I. Love. this! Also love just vanilla with a bit of cinnamon :) thx! Can you make it without the berries mixed into the pudding? I want to put them on top, for garnish. Yes. I think that will be fine. Thanks! I just want to make sure the consistency will still turn out ok. I think it will. Let me know. Do you leave the chia seeds whole or do you grind them first? Thanks.